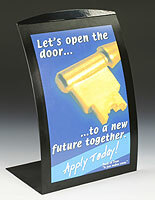 Store Fixtures : This silver picture frame can hold retail signage! 5.5" x 8.5" 8" x 11.5" 11" x 17"
This silver picture frame, also known as a sign holder, is designed for use as a countertop display. 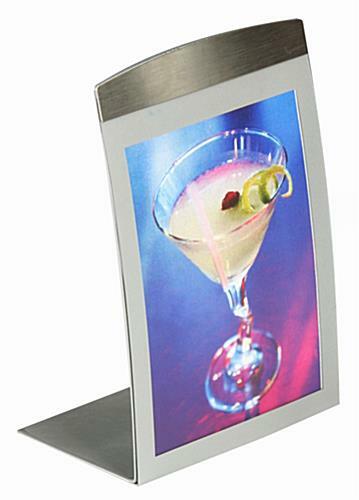 This silver picture frame is constructed from durable aluminum, and can display 4"w x 6"h prints. 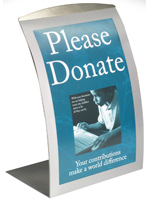 This countertop display can be used for any form of advertising, or even for personal usage. 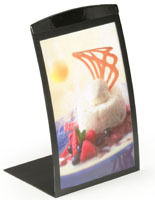 The photo holder, silver picture frame allows you to advertise pictures, menus, cards and notices. This silver picture frame is an ideal advertising tool for you to showcase your prints in a fashionable way. The silver picture frame features a contemporary, curved design. 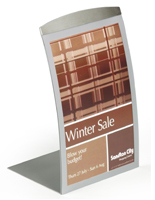 The curved style makes this silver picture holder stand out in any location. 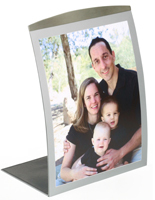 This picture frame also features a magnetic, "lift up" lens for quick graphic changes. To change your graphics, simply lift up the clear, non-glare lens, and place the prints behind the lens. 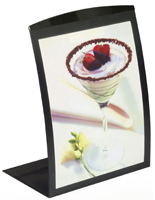 We include the silver picture holder with the non-glare lens to prevent reflection and damage from occurring. 8.3" x 7.0" x 3.0"